Power lift recliners function and appear as just a simple recliner, but they are a great resource for a number of people, including those who need to keep feet elevated and those who struggle standing up. If you or your loved one have limited mobility, suffer from sore joints and stiffness, or suffer from a any number of health conditions. You will find that these power lift recliners for heart care are a good choice. This article focuses on feet elevation but we do have a more moderate choice for those that just need to keep feet elevated. Lift chairs are a popular choice for individuals with heart, circulation and edema, or arthritis issues, as these products can situate the body in various positions. Many lift chairs offer the Zero Gravity position, which works to alleviate physical stresses on the body, helping to relieve sore joints and muscles. Other heart patient lift chairs offer the Trendelenburg position, which places the legs and feet slightly above the heart and helps to reduce swelling in the legs and increase blood circulation. 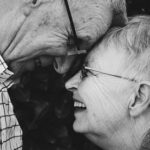 Each of the lift chairs on this list is completely automatic and includes easy-to-use hand controls, making them perfect for all individuals, even those with dementia. These products do differ in material, design, and size, and we hope that we can help you pick the perfect chair for you or your loved one. Positioning feet elevated above the heart means there is less force needed to circulate blood throughout our body. In a standing position our feet are on the ground so, the blood moves thru our body, down our legs, into our feet and back up to our heart for fresh oxygenated blood. If the feet are elevated, the pump circulation is easier because there is less gravity pulling downward towards our grounded feet. In other words, think of your heart as a pump. It pumps the blood around your body. There is input to our heart and there is output. The condition of our heart may mean that perhaps our heart is not pushing (output) as much blood. With our feet elevated above the heart you make it less stressful on your body. 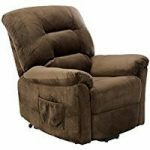 The MaxiComfort Series power lift recliners are built for comfort, and this chair is a great budget-option, though it is on the larger side. These heart patient lift chairs provide the largest size range of all the products on this list, and they provide especially great sizing options for those on either extreme end of the height spectrum or for heavier individuals. This electric lift chair is great for individuals of all sizes and comes in a wide range of options: junior petite, which is ideal for individuals between 4’8″ and 5’0″ tall; small, for users between 5’0″ and 5′ 3″; medium, for those 5’4″ to 5’10”; large, for users 5’11” to 6’2″; and tall, for those between 6’3″ and 6’8″. Chair handles up to 375 pounds, and the extra wide handles 500-pound. Fabric color options include admiral, palomino, cabernet, pearl, evergreen, buckskin, and coffee bean, allowing for a custom made look. This power lift chair is fully automatic, and it utilizes a two-motor design with both lift and recline ability. It offers unlimited reclining positions and a standing position, making this chair a great option for patients with a wide range of health conditions. These power lift recliners offer a 90-degree TV watching position and a Total Comfort position, which elevates the legs while maintaining an upright backrest to cater to patients with conditions like lower extremity edema. 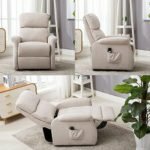 These models also include laying, zero gravity, and Trendelenburg positions, making this a great choice when considering heart patient lift chairs. This chair utilizes Golden AutoDrive controls, making total adjustment easy for all patients. It has a simple, backlit two-button control with lift and recline buttons, a button to lockout the chair position, and others to control the footrest and backrest individually. It also includes programmable memory settings, allowing for preset TV, sitting, zero gravity, and sleeping positions that can be applied at the touch of a button. A battery pack is installed in case of a power outage. 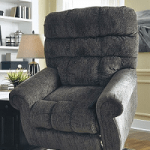 This lift chair offers a plush, seamed backrest, and it includes lumbar support for added comfort. This model also utilizes MaxiComfort positioning technology to help encourage proper joint alignment and alleviate pressure points. However, this model does not include heat and massage capabilities, but it can be incorporated for $195. This chair includes a removable back for easy cleaning. It does take up a fair amount of space, with widths ranging from 30.5 to 34.5 inches, and it needs to be located between 22 and 27 inches away from the wall depending on the model. A lifetime warranty is included on the wood and metal frame, and the electronics include a seven year warranty. This Pride lift chair is a great option for heavier petite users, as it comes available with an extra-wide seat. This chair also has a fast motor that can be useful in certain situations, and the remote can be placed on either side, which is great for left-handed users. This chair is available at a value-price and is ideal for a number of health conditions. This electric lift chair comes in three sizes, including petite wide, medium, and large. The petite wide model is best for those under 5’3″ tall and has a 24-inch wide seat, the medium fits users from 5’4″ up to 6’0″ and has a 20-inch seat, and large is ideal for individuals between 5’9″ and 6’2″ and has a 22-inch seat. All chairs have a 375-pound weight limit. This chair is available in various colors of Dura Soft Fabric, including ember, oat, deep sky, and timber. Other materials, such as Crypton, Lexis Urethane, and Ultra Leather, are available at additional cost. This is an infinity position chair, meaning that it allows for full adjustment from standing and a vertical 90-degree sitting position to the Zero Gravity and Trendelenburg positions, making this chair perfect for patients with heart or circulatory conditions, arthritis, lower extremity edema, or who often sleep in their chair. This chair has a fast motor, allowing for quick transitioning to the standing position if needed, and it has a battery backup in case of a power outage. It also has dual pockets, allowing you to position the remote on either side of the chair. The remote is easy to use, and it includes a USB port to allow for device charging. The Pride Mobility Infinity comes equipped with lumbar support, pocketed coils to alleviate pressure points, and there is no gap between the seat and the footrest when it is raised. An extended footrest can be included on these chairs if needed. Heat and massage capability is available on these chairs as well for an additional cost. The chair must be placed between 19 and 21 inches away from the wall. The chair has removable back, arm, and head covers for easy cleaning. The frame includes a lifetime warranty, and they offer a seven-year warranty on the electrical parts, with four years of free repair and replacement and the final three years offering discounted costs. This Cirrus heart-condition-friendly chair is built to be a firmer seating option, so we suggest this chair if you prefer firm support over a softer chair. The coil design provides great support, and this chair is available in sizes to fit the majority of individuals. This chair is priced reasonably; however, we found the armrests to be slightly narrow, which can be a negative for some users. This chair comes in small, medium, and large sizes. The small size is best for those 5’0″ to 5’3″ and that weigh up to 300 pounds. The medium fits users between 5’4″ and 5’10” and up to 375 pounds, and the large is ideal for individuals between 5’11” and 6’2″ and also has a 375-pound weight limit. The Cirrus is available in palomino, admiral, evergreen, cabernet, pear, and buckskin colors. This Zero Gravity chair is a great option for all types of users and health conditions, as it has unlimited positions. There are also dual controls that allow the seat and backrest to be controlled individually. 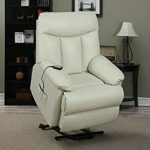 This allows for maximum comfort and makes this model ideal for heart patients and those who spend a large amount of time in their electric lift chair. The Cirrus lift chair also utilizes the AutoDrive controls, allowing for easy control to infinite positions, including the standing, zero-gravity, and Trendelenburg positions. Preprogrammed settings are also available to ensure maximal comfort, and a battery pack is installed for backup power. The chair utilizes 49 spring coils on top of five heavy-gauge seat springs to provide firm support and comfort. The armrests are extremely comfortable and include five inches of foam padding and Dacron; however, we found that the armrests could be slightly wider and they do not have covers. Heat and massage capabilities are available for an additional $220, and a footrest extension is available for $110 extra. The fabric material used on these chairs is stain resistant, and the lift chair includes removable headrest cover. However, there are no removable armrest covers for cleaning. This chair must be placed 22 to 24 inches from the wall, and it comes with a full warranty on the frame, a three-year parts warranty, and a limited warranty with discounts for the next four years. This chair is built for comfort, and if having customizable lumbar support is critical, this chair is a great option with its zippered waterfall backrest design. This chair is slightly pricier than other models, and it also does not include any sizes for smaller individuals. However, this lift chair can adjust to any position, making it ideal for all users and conditions. The Golden Relaxer lift chair comes in medium and large sizes. The medium chair is best for individuals 5’4″ to 5’10”, the large model fits users between 5’11” and 6’2″, and both models can support up to 375 pounds. Fabric color options include copper, shiraz, calypso, sterling, and hazelnut, and numerous colors of velvet, faux leather, NanoTex, and vinyl materials are also available for an additional cost. This Zero Gravity chair allows for every position between standing and the Trendelenburg position, ensuring ultimate comfort for any user. The adjustability makes this chair ideal for users with heart conditions, poor circulation, arthritis, and more. The seat and backrest can also be individually adjusted as well with the dual-motor design. The Golden AutoDrive remote allows for single-button adjustments and for saving favorite positions. This chair can also include a left-handed attachment for an extra cost. An easily accessible battery pack is included for emergency use. This chair uses a plush four-pillow waterfall backrest, includes adjustable lumbar support, and has overstuffed armrests for extra comfort. The many chair positions allow for comfort during any activity. Massage and heat capabilities are available for both the back and seat areas, and an extendable footrest can also be added. This chair must be set up 25 to 27 inches from the wall, placing it on the larger side. This chair does have a removable headrest cover, but none for the armrests, which can be exposed to wear and tear. The fabric is all stain resistant. Golden’s seven year parts and lifetime frame warranty is also provided. The Golden Power Cloud lift chair offers plenty of comfort and support with its heavily padded, bucket-seat design and the Power Pillow articulating headrest for head and neck support. This chair is the most expensive model on our list, and it is only offered in a single hybrid size, but it is a great option for any user, especially those with heart or circulation conditions with the position adjustability. This chair comes in a medium-large hybrid size that fits users from 5’7″ to 6’2″. The 20-inch wide seat is fairly standard, and it has a weight capacity of 375 pounds. This chair is available in multiple fabric colors, including shiraz, sterling, calypso, copper, and hazelnut. Suede options are available in mahogany and silt colors, and faux leather is available at an additional cost. This medical lift chair offers unlimited positions, including standing, sitting, laying, Zero Gravity, and Trendelenburg, and all of these are accessible with the press of a button. This chair moves to Zero Gravity and Trendelenburg positions. This chair has storage convenience and comes with 2 pockets on each side. The Auto-Drive remote is programmable and has simple two-button controls and settings. As in most of the lift chairs for heart patients there is an emergency backup. This product’s Power Pillow articulating headrest provides superior head and neck support. 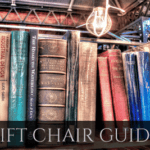 This lift chair also includes an overstuffed biscuit-style backrest, a padded chaise, and plush wide armrests that cradle the user and allow for a combination of support and comfort. This chair has heat and massage capabilities available for an extra $278, but cannot utilize an extendable footrest. This chair does not include removable headrest or armrest covers. This chair needs 24-inches of space from the wall, and it includes Golden’s standard seven-year parts and lifetime frame warranty as well. If your loved one or patient uses a wheelchair or a scooter, we definitely recommend this lift chair. 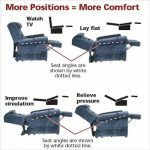 The power armrests make transfers easy, and even though this product comes in at a slightly higher price point and single size, this feature can be very beneficial. This Cozzia chair also needs to be only 15 inches from the wall, making it the most space-efficient model on the list. However, since this chair does not include the Trendelenburg position, therefore it does not fit the conditions you may need for heart patient lift chairs and the other models may be more ideal for users with heart or poor circulation conditions. This lift chair comes in a single size, which seems consistent with the medium size on other models, and it has a weight capacity of 300 pounds. This chair comes in an espresso color and includes an extendable footrest to cater to taller individuals. The footrest and backrest operate independently of one another, allowing this chair to move into a variety of positions with ease. The chair includes sitting, standing, and Zero Gravity positions, but it is not able to extend into the Trendelenburg position. This chair is designed for individuals that utilize a wheelchair or scooter, the powered armrests lower to the height of the chair for easy sliding transfers. The remote is also easy to use, as it utilizes simple two-button controls for the armrests, backrest, and footrest and can be programmed for TV, lift, and Zero Gravity positions. Storage pockets are available on both sides, and a backup battery is also included. This chair incorporates an adjustable, cradling headrest. The cradling headrest allows for customized neck and head support. The seat is composed of memory foam, which ensures optimal comfort. This Cozzia chair also comes included with a pop-out footrest extender, but this medical lift chair does not include heat or massage capabilities. The fabric used is water, stain, and oil repellent, making this chair easy to clean. The chair weighs about 160 pounds which is the heaviest on list. But it only needs 15 inches from the wall. 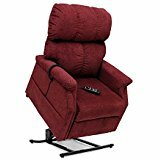 Inexpensive option if you were looking for a lift recliner that makes it easier on the heart but does not get to the extreme position.